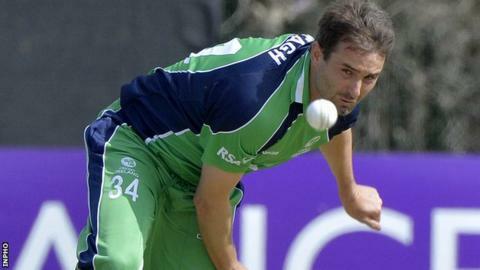 Tim Murtagh has been ruled out of Ireland's one-day international against England in Malahide on Friday. Murtagh, 33, suffered a hamstring tear to his left leg while playing for Middlesex against Durham in the County Championship at Lord's on Sunday. The seamer will undergo an MRI scan on Tuesday to assess the extent of the injury. Ireland have opted not to replace Murtagh as they named 14 players in their original squad for the match. Murtagh pulled up with the hamstring twinge after bowling only two balls against Durham, having limped out of Middlesex's game against Somerset last week. He missed Ireland's World Cup campaign because of a foot injury.